BGZ takes over the technical coordination of all ARRIVO BERLIN projects for the vocational integration of refugees. We also receive the Erasmus+ Mobility Charter for Vocational Education and Training – recognition from NA BIBB for implementing high-quality mobility projects. New grants for BGZ-projects with the focus on digitalisation: The Interreg-project Baltic Game Industry promotes together with 47 partners the games industry in the Baltic Sea region; Fit4BIM provides digital skills for tomorrow's skilled labour in the construction industry. The BGZ is launching its 4th project in the Berlin showcase electromobility: Car-2-Lab provides digital competences in the automotive sector. Together with EPIZ, we received the approval for a second Erasmus+ project: “GastroINKLUSIV – New models for inclusive professional vocational training in VET schools”. BGZ and the Chamber of Small Business and Skilled Crafts Berlin start their first project aimed at the professional integration of refugees. ARRIVED – Willkommen im Berliner Handwerk – accompanies refugee people in their dual training. The project will continue in 2016. With ”Learning eMobility+“ and ”Time – Train Intercultural Mediators” the BGZ begins two projects in the new EU programme Erasmus+. The Federal Minister of the Interior of the Federal Republic of Germany Dr. Thomas de Maizière awards the BGZ-project PROTECT with the sponsoring prize Helfende Hand. The team of PROTECT wins the first price in the category “innovative concepts”. Two new projects in Electromobilty Showcase : In the joint project “Vocational and Further Training for High-voltage Technology in Motor Vehicles”, the BGZ takes the lead in setting up an international network on vocational training. “Berlin Mobil” promotes the European exchange of experiences for trainers of car mechanics. Two new projects for lifelong learning are launched: the Grundtvig project PROTECT – learning and helping in honorary positions and the innovation-transfer project GiB 8! Health in professional life – health competence as a quality factor”. Awareness for Fairness is granted more awards by the German UNESCO commission and the nation-wide education congress WeltWeitWissen (World-wide knowledge). An external evaluation of the BGZ confirms the successful development of the previous years. BGZ launches two projects in the new field of global learning: BerufeGlobal and Awareness for Fairness. “Awareness for Fairness” is one of the three winners of the World Aware Education Awards 2010, granted by the North-South Centre of the Council of Europe. In cooperation with the Berlin Fire Department and the Chamber of Small Business and Skilled Crafts, BGZ sets up Einsatz Berlin , which opens up a new approach to fire department careers in middle-ranking positions. Umbau & Ko receives the Leonardo prize 2009: Innovation in practice, and is commended as an excellent practice-oriented project in the programme for lifelong learning. With Leonida the BGZ launches its third major ESF-project..
With EU in Motion and Health Exchange BGZ implements further projects in the health master plan. KoTransfer is launched as a follow-up project to Umbau & Ko in the thematic area of environment and energy. In cooperation with the Senate Department for Economics, Technology and Women's Issues and other partners, the BGZ organises the 2nd International Water Conference (IWC) as part of the Asia-Pacific Weeks. Experts from 25 countries around the world exchange ideason: How can access to clean drinking water and the management of water and wastewater be improved? The BGZ organises the DigiTales film festival “EQUAL Opportunities for All” in cooperation with the Berlin public transport television, “Berliner Fenster“, and the radio station “radiomultikulti”. The BGZ starts “Active Health”, its first project within the framework of the master plan “Health Region Berlin”. The second EQUAL development partnership of the BGZ is approved. “ProIntegration – Integration through intercultural main-streaming” takes off with nine partial projects in Berlin.The BGZ implements two major EU projects (MEDA) for technical aid in Turkey to bolster regional fire services in Kocaeli and Adapazari in the fields of institutional development, staff training and disaster control. Renamed “BGZ Berliner Gesellschaft für internationale Zusammenarbeit mbH” (Berlin International Cooperation Agency Ltd) after a reorientation of region and content. New projects are launched, including “Networking Berlin” and the first German-Turkish mobility projects via the Leonardo da Vinci programme. Implementation of the International Water Conference in cooperation with the Senate Office for Economics, Labour and Women’s Issues. The BGZ takes on another remit: Promotion of cooperation between administration bodies and support of Berlin city partnerships. The International Conference for Women Entrepreneurs for participants from the partner cities of Warsaw, Prague, Budapest and Istanbul is the first in a series of conferences. First cooperation with the European Training Foundation for the preparation of Bulgaria, Romania and Turkey for entry to the EU. Integration of immigrants becomes a further focal point of BGZ projects. Start of the nation-wide EQUAL development partnership ProInteCra – vocational integration of immigrants into skilled crafts. First projects in Poland: Seminars for social partners and exchange and qualification measures in the German-Polish border region, promoted via the BMBF (Federal Ministry of Education and Research) and the EU Leonardo da Vinci programme. The BMA (Federal Ministry of Labour) promotes the BGZ projects for the reintegration of Gastarbeiterkinder (children of guest workers) in Turkey. Project locations are Marmaris and Köycegiz. BGZ sets up the Foundation for German-Polish Cooperation (BGZ- Fundacja Wspolpracy Polsko-Niemieckiej) in Warsaw. Dr Albert Freitag, BGZ founding director, Dr C. Sencer Imer, MEKSA president, Dr Erdogan Okyay, MEKSA vice-president and Dr Irfan Yazman, MEKSA director receive the Bundesverdienstkreuz (Federal Cross of Merit) for their services to German-Turkish cooperation. A training hotel is established in Köycegiz (MUGLA) and put into operation. New training projects are launched in skilled crafts and services in six locations in Turkey. Expansion of BGZ activities to Poland and other Central and Eastern European countries. Agency renamed as BGZ Berliner Gesellschaft für entwicklungspolitische Zusammenarbeit mbH (Berlin Development Cooperation Agency Ltd). BGZ and MEKSA’s first tri-lateral project with partners in Kazakhstan, Kirgisien, Turkmenistan and Uzbekistan. MEKSA initiates the membership of TESK in UEAPME (European Association of Craft, Small and Medium-sized Enterprises). Revision of the Turkish Trade and Crafts Act: Establishment of dual vocational training. BGZ approaches Swiss DEZA and coordinates a regional project package of MEKSA-DEZA cooperation in the south-east of Turkey. Adana, Marmaris and Eskisehir become locations for projects which also include the vocational fields of woodworking and tourism. In Istanbul and Izmir BGZ initiated master-craftsman’s training modelled on the German system. Vocational and further training for unemployed people and young repatriates becomes a new area of involvement for BGZ/MEKSA. The project is financed by the BMA (Federal Ministry of Labour). Start of train-the-trainer seminars in Turkey; first trade examinations in Istanbul and Izmir. 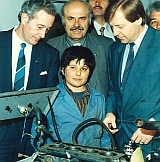 Federal President Richard von Weizsäcker visits the BGZ/MEKSA training project in Izmir. BGZ is co-founder of MEKSA (Foundation for the Promotion of Vocational Training and Small Industry) in Ankara. Dr Erdogan Okyay is appointed Secretary General. First funding from BMZ/GTZ (Federal Ministry for Economic Cooperation and Development/German Society for Technical Cooperation) for the “promotion of company training schemes in developing countries”. Projects launched for vehicle mechanics, machinists and fitters In Ankara, Istanbul and Izmir. Foundation of the BGZ as “Berliner Gesellschaft für deutsch-türkische wirtschaftliche Zusammenarbeit mbH“ (Berlin Agency for German-Turkish Economic Cooperation Ltd.) on the initiative of the reigning mayor of Berlin, Richard von Weizsäcker. The aim is to promote SMEs in Turkey and German-Turkish cooperation in vocational education.